This appears in the 1969 catalogue for Weston Woods Studios. As far as I know, Crockett Johnson said these words on no other occasion. He did, in 1943, tell journalist Charles Fisher, “I don’t draw or write Barnaby for children. People who write for children usually write down to them. I don’t believe in that” — a sentiment echoed above. 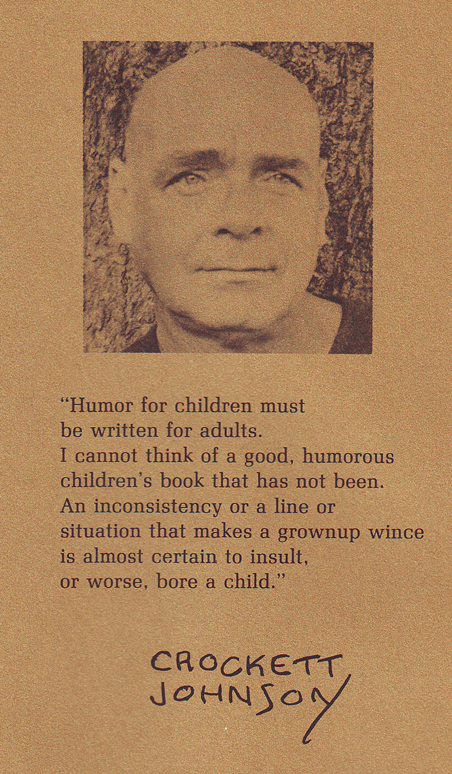 But this Weston Woods catalogue is my sole source for these thoughts on humor. And, as it turns out, I ended up not using them in The Purple Crayon and a Hole to Dig: The Lives of Crockett Johnson and Ruth Krauss (forthcoming from the University Press of Mississippi, 2012). Perhaps they’ll turn up in The Complete Barnaby (first volume due from Fantagraphics in 2012)? And, with that brief excursion into some (currently) un-used materials gathered while researching the bio…, I’ll conclude.